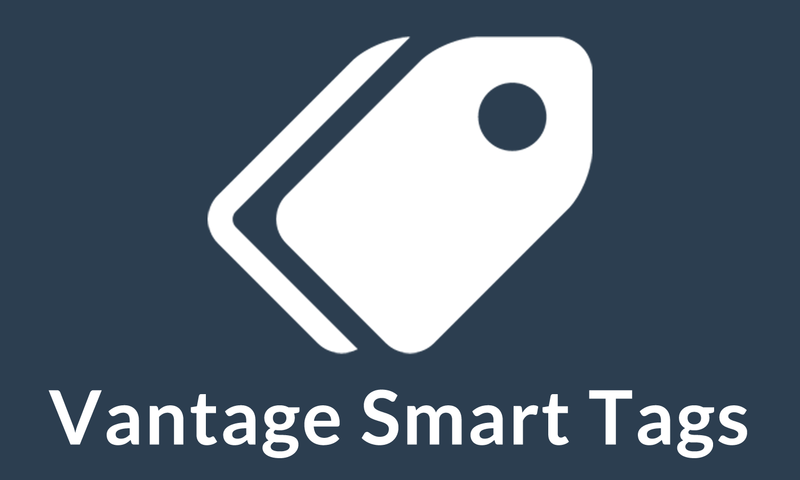 Make smarter use of the tags in Vantage with the Vantage Smart Tags plugin. The plugin will let you convert all multiple choice fields like drop-down, checkbox and radio buttons as well as location components (like country, state, city) into listing or event tags, so you only have relevant tags that either you have created in the form of field values, or they are location names that are supplied by the Google Geocoder API. Also turning the right kind of fields into tags will give your site a big SEO advantage! The solution to this problem is simple. 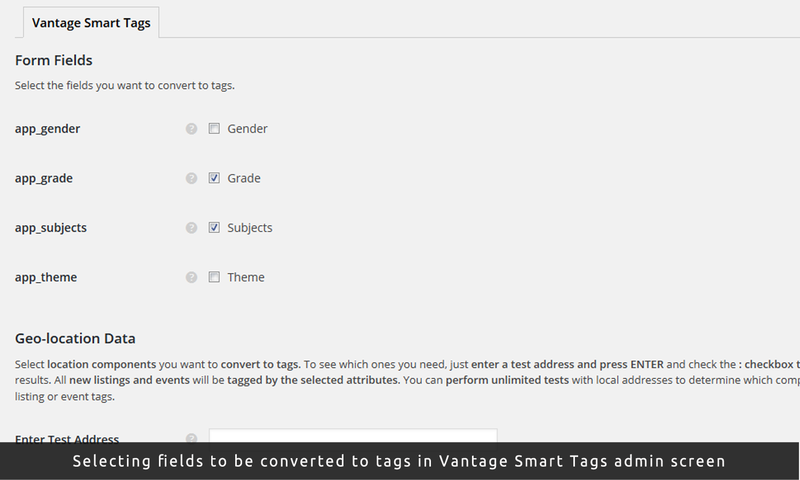 Use Vantage Smart Tags instead to convert the multiple choice fields (i.e. 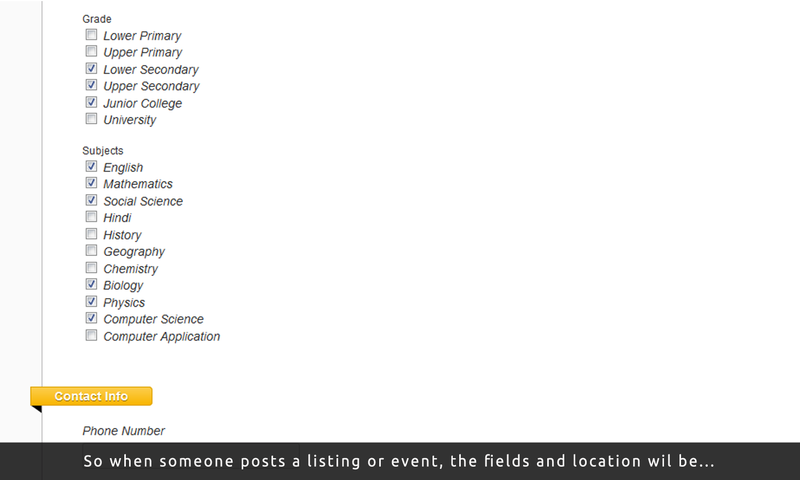 drop-down, checkbox, radio) into tags for your listings and events. For example, if you have a tutor directory website, in which you have a drop-down or a radio field called “Preferred Time” with options “Morning” and “Evening”, you can convert it to ad tag using the plugin, and all the new listing will either be tagged “Morning” or “Evening”. Now the students looking for morning tuitions can click on the tag called “Morning” and see all the tutors available in the morning. 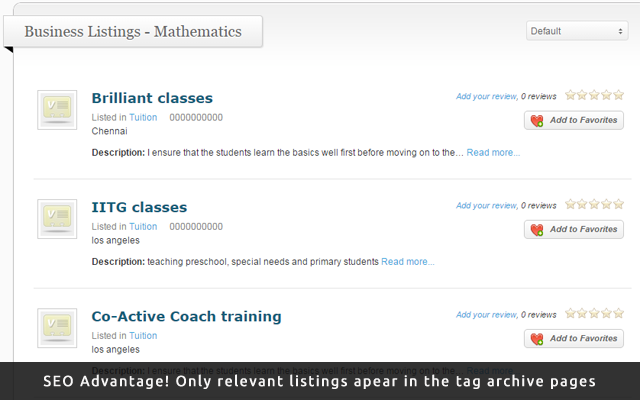 In the same way, if there is a checkbox field with all the subjects as options, a listing can be tagged in multiple subjects when the tutor posts it, and the result is each subject has its own tag page listing only the tutors that teach that particular subject. Simple, isn’t it? That’s right! Didn’t you always want your users to find all listings or events within a location on the same page? 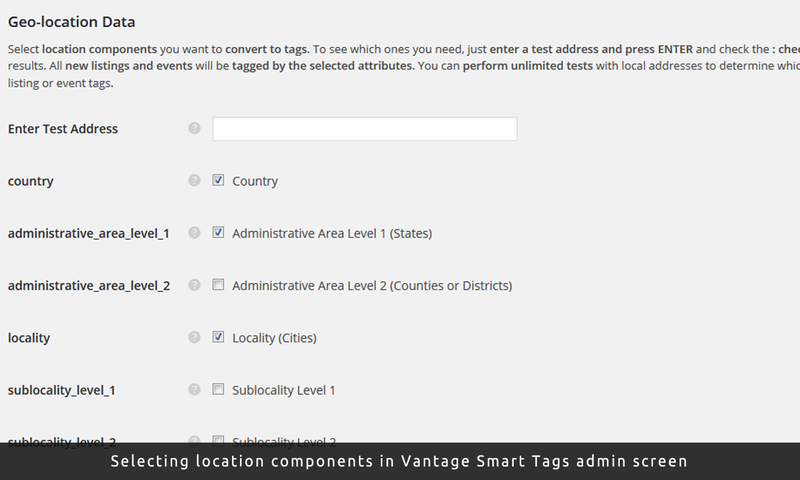 Vantage Smart Tags will allow you to convert up to six location components (like country, state, districts, city, etc) into tags, that Google will reverse geocode from the location entered by listing owners. You can even test the locations in the settings page by entering sample addresses and checking what Google returns against each component to help you select the most relevant ones. SEO friendly – each tag page will have relevant listings or events, hence you can proudly display your tags in widgets, menus, etc! Location pages – you can add countries / states / cities to your menus and your users can find geocoded listings or events on the same page. Test location results before deciding what you want as a tag. Limited number of tags – The maximum number of tags is the sum total of all the value in the fields you convert to tags plus the number of Google recognised locations that you have selected to be converted. No misspellings, hashtags or unnecessary mistakes – Since all the tags come from options that you have created or Google has supplied, no need to remove spammy tags every few days. Note: Supports Vantage 4.0 and above. If you are running Vantage 3.x, please email us with your AppThemes username and we will send you the older version of the plugin. Please bear in mind that we only provide support for current versions of our extensions. Select the fields / location components that you want to convert to tags. 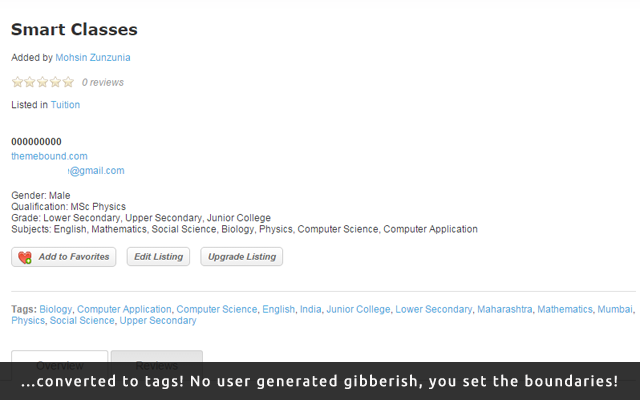 This is a great plugin for streamlining your tags. I’ve got mine set to automatically use tags for location. This then means the listings in each area automatically have a dedicated tag page, and you don’t need to rely on people adding tags or spelling the locations correctly. 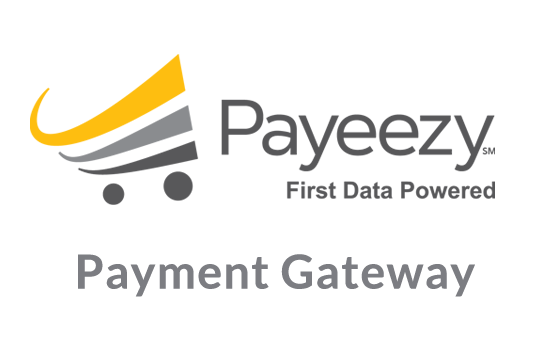 This is a must to have on any Vantage directory site. This works on a clean install of Vantage 3.0.1 + Flatpage child theme. 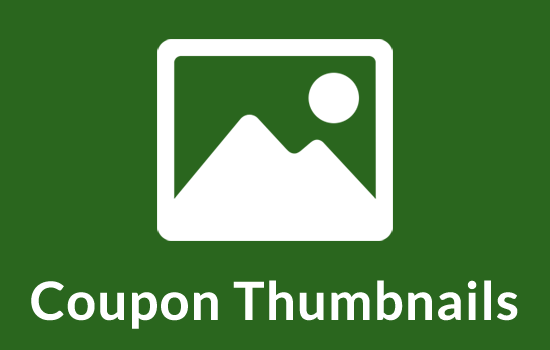 Plugins like these do a lot of good work for your site behind the scenes. Good on you Mohsin for recognizing the value of correct tagging. Many people don’t understand its value and some guys even believe that Tags are not liked by Google! But for Directories like Vantage, tagging in my experience is extremely valuable. So I recommend this plugin to help structure your content to make it useful to readers and search engines. Does the plugin create tags for existing listings or only on new listings? It will create tags for all the new listings, plus the existing listings that are edited or re-listed. In short it won’t create tags when you activate the plugin, but when any of those listing forms are processed. I see, OK am wondering how we might do that then. Just that I already have 5000+ listings and would really like a way to run some script to add the tags to each one…..am wondering if we bulk edit listings would this trigger the Tags to be created? I have installed, using with Vantage 3.0.1 and Flatpage theme. I edit existing listings and then save them but no new tags are being added, I ahve setup with the options checked for location and it tests OK in the plugin and picks up the address fields. However its not adding tags to the listings and no new tags being displayed on the front end. Same with new listings, no tags being added. Can you please setup admin access for me and send it over by email? You should be able to locate the email address from the support tab above. Just a follow up on this…..we have the Vantage Smart Tags working on our test environment in a fresh install of Vantage 3.0.1 plus Flatpage. Its working fine. Our issue must relate to a plugin conflict perhaps or some mods we have done. Question… When I edit a listing in the back end, no tags are created. Only when edited from the front end. Is that correct? If yes, do you have plans to create automatically the tags thru creating or editing listings in the back end for future releases? Yes, that’s correct. Because the action it hooks to is a Vantage hook that only works in the front end. I don’t have firm plans about adding the back-end functionality, at least not in the near future. But, as they say, never say never. Ok. Noted. I am using it now and i’m very happy. I do find that I am able to “Edit” the tags in the backend (once they were created in the front end) and add descriptions, even change the tag names (as long as the slug is not changed). Will it work if you are using bing maps api instead of google? It appears to work yes. It will use the Google API even if you have it disabled under Vantage options. If the listings on your site don’t run for indefinite period, it is still a good thing to have perhaps. Does this plugin work with Directory Child Theme? Thanks for the interest. Yes the plugin should work with any child theme. Can i use the tag in an individual page? for example i want to make the cities tag….. i create a page for example London with a little description and i want to insert the #London so if someone click on the tag to show him all the listings for London….is that possible? Yes, it is possible. You can create London as a tag and add a description. Then just make sure to set the address component corresponding to a city as active and all listings posted in London will automatically be tagged, and other ads will be tagged as the city they are posted in. Updated to Vantage 4.0 so I renewed my purchase to have Vantage Smart Tags to work with Vantage 4.0. Now… I don’t see where to edit listings from the front end in Vantage 4.0 to make the tags work. http://youriste.com/edit-listing/?listing_id=35 (where 35 is to be replaced by your actual listing ID). 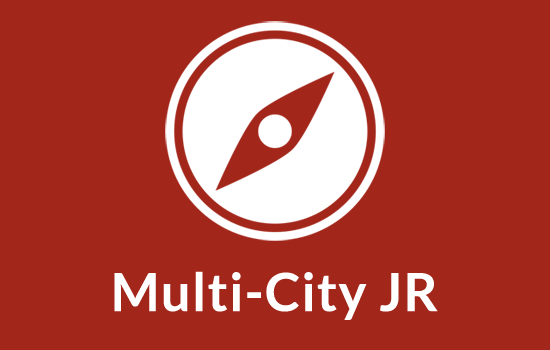 Adds location based city filters to JobRoller.